Michele Bilyeu Creates *With Heart and Hands*: What Does Your Love of Color Say About You? What Does Your Love of Color Say About You? Some of them may seem sweet and gentle, others conjure images of aggressive, happy, or sad feelings. Some of these emotions are universal, independent of place and time. For example, the sea and a distant horizon invoke a sense of journey in all of us, a journey to another place or to an inner world. They ultimately give us a sense of encountering our self. Because they are active from the moment we encounter them, these images are an integral and active part of our psychological identity.And because they are universal and we all share them, they constitute a frame of reference. They are part of what Jung called the Collective Unconscious. They are called archetypes, i.e. universal psychological references. When you choose a color, it’s not an expression of your analysis of chromatic values, but an unconscious expression of your attraction to or rejection of the emotions born by this color. You thus indicate your preferences on a universal reference scale. You show what emotions carry you, and what emotions bother you. You reveal who you are. 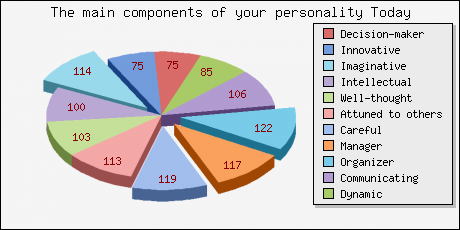 Now, if you were to give me a color pie chart, this is not what I would pick as my favorite colors (in order of size) nor what I would see as my necessarily strongest personality traits in this order. But obviously, when I am asked to work backwards by a process of eliminating colors and how I see or don't see colors in almost the same range as also close choices, then creates a different way of looking how my brain worked and not just how I thought I was choosing.I found that alone, quite interesting! to decode its inner workings to lay it bare. There are an endless number of colors in the world, and an endless number of personalities. There is a fun site named "Testcolor" which unveils 5 personalities that are part of the infinite emotions, of our universal color palette. You can take the test as I did, it only took a few minutes, and then you get your own individualized results. But there area also lots of other links for favorite colors etc. that I enjoyed just as much! What Colors Do You Love?And What Does Say About Your Personality? Hi Michelle, the results pretty much matched what I know about myself. Makes me feel very transparent. I think it's amazing how close these test results usually are. I WAS a bit surprised by a couple of the results, but for the most part the results were pretty accurate. But you know, when you actually see in writing how you determine the decisions you make, it makes you think about yourself. Based on these results, I'm pretty happy with how I do that. Very Interesting post and test. In my world, transparency is considered a good thing! It means we are open to life, to change, to understanding, and to wisdom. So, good for you, Celia!! They are all fascinating peeks into who we are versus who we think we are. When they come this close, I do believe we know who we are and in a good and wise way. Either that, or perhaps we are just on the path to living our true destiny without the subterfuge that some need to hide behind! In any case, I love learning new things about how the brain works, as well as what factors make us who we are! It's all about the choices we make in life and how we love!